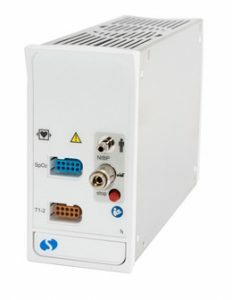 The Command Module (91496) is the core of the Spacelabs patient monitoring system, providing the processing power for all basic physiologic parameters. You can select from a variety of configurations to suit the monitoring needs of specific patients or care units in the hospital. With the optional Data Shuttle feature, transfer up to 24-hours of patient demographics, physiological data and applicable measurements settings between Spacelabs monitors without having to re-cable patients. Continuous monitoring of electrocardiographic signals can detect abnormal cardiac rhythms, including life-threatening arrhythmias such as asystole, ventricular fibrillation, and ventricular runs. The monitor’s input circuits are protected for use with electrosurgical equipment and defibrillators. Cardiac pacemakers or other electrical stimulators do not affect and are not affected by operation of the module. ECG software provides alarms for high and low heart rates, for ventricular fibrillation, and for asystole. Diagnostic ECG meets all the requirements and standards for electrocardiographic devices, providing the ability to obtain a diagnostic 12-lead report as a function of the monitoring system. Diagnostic 12-lead ECG is available with and without measurement and interpretation. The 12-lead report provides a set of diagnostic-quality electrocardiographic waveforms that accurately represent both the detailed cardiac cycle and the cardiac rhythm. 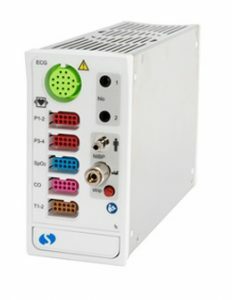 ST segment review is available or the A, B, and C Command Modules, providing up to nine 1-second ST segment sets for up to 12 leads. Three levels of arrhythmia is available: basic, standard, and advanced. Pulse oximetry is used to continuously and noninvasively measure functional oxygen saturation in the blood. The pulse oximetry sensor contains two infrared light-emitting diodes (LEDs) and a photo detector to measure how the amount of light absorbed by the arteriolar bed varies during pulsations. 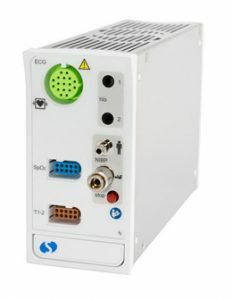 The SpO2 sensor is also used to continuously and noninvasively measure pulse rate. The monitor displays this functional oxygen saturation as percent SpO2. When ordering the Command Module, you have a choice of SpO2 technologies: Spacelabs, Masimo SET, or Nellcor OxiMax. Noninvasive blood pressure (NIBP) uses oscillometric monitoring to measure systolic (S), diastolic (D), and mean (M) arterial blood pressures. Spacelabs’ monitors display the most recent reading with the time that reading was initiated, storing up to 120 readings with the ability to display up to five readings at one time. 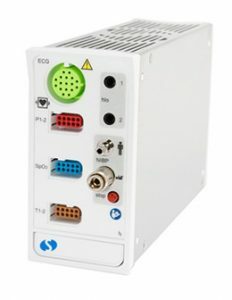 You can monitor up to four temperature inputs. When two temperatures from the same module are being monitored, a delta value (temperature difference between the two readings) is calculated. The 91496 Command Module is a direct mode clinical thermometer as defined in ISO 80601-2-56. Temperatures are displayed in degrees centigrade. You can set independent high and low alarm limits for each temperature and for the delta temperature. In addition to temperature inputs on the Command Module, Xprezzon, Qube, and Qube Mini patient monitors support the Exergen Temporal Artery Thermometer (TAT) model TAT-5000S-USB-GN to collect and display episodic temperature data. Invasive (intra-arterial) blood pressure (IBP) monitoring allows constant measurement of a patient’s blood pressure beat-by-beat. A pressure key and waveform automatically display when you connect a pressure transducer to the module. Systolic, diastolic, and mean pressure values are displayed for arterial, pulmonary artery, umbilical artery, umbilical vein, and generic pressures. The mean value displays for other pressure types, except for ICP. Cerebral perfusion pressure (CPP) is computed as mean arterial pressure minus intracranial pressure (MAP-ICP) if ICP and ART are being monitored. Respiration is available for the 91496-A, B, and C modules. Changes in thoracic impedance during patient inspiration and expiration provide respiration data through the ECG cable. Cardiac output (CO) monitoring enables you to evaluate the patient’s fluid status and the pumping ability of the heart. CO calculates and displays various hemodynamic values using thermodilution. In the NICU, surveillance of vulnerable infants in neonatal units is enhanced with Spacelabs’ Varitrend® 4 oxycardiorespirogram. This capability automatically trends and documents critical physiological events such as apnea and bradycardia episodes. Define, trend, and document events containing data from up to four parameters, which may include heart rate, SpO2 (pre- and post-ductal sites), respiration rate, EtCO2, TcpCO2, or TcpO2. 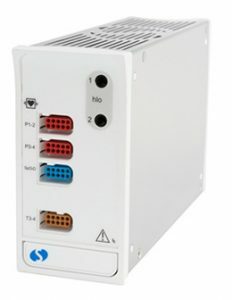 Varitrend 4 is available for the 91496-A, B, C modules. The 91496 Command Module is available in five different configurations from low to high acuity.